Editorials InfoisInfo – Find Mobile Shops Nearby in your Area! InfoisInfo – Find Mobile Shops Nearby in your Area! Ever wanted to find the nearest mobile shops in your area for buying a new smartphone or repairing the existing one? Fed up of asking your friends and colleagues for the trustworthy shops? 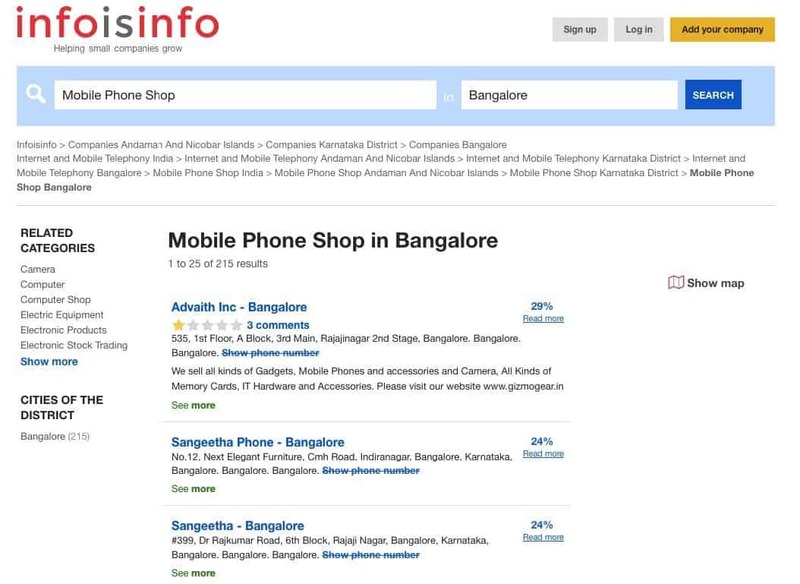 Here is a simple solution namely InfoisInfo which is a website that acts as a search engine and can list the nearest mobile shops in your area. The website is actually not only for the mobile shops but includes a wide variety of functions. But here, we are going to discuss about finding the mobile shops. With around 4400+ mobile shops listed, the database contains most of the trusted mobile dealers all over the country. There are special algorithms to sort out the best dealers from high to low quality based on a percentage score. This helps you to find the best stores out there without having to spend time on researching the trustworthiness of the dealer. Based on the distance to the shop, you could easily find out the best suit for your needs. Each and every listed shop will include the complete details including Full address, Mobile number, Website and even Map route to the shop. So that you don’t have to run an extra search to find it out on the Google maps. It also includes the complete description of their services and what they offer. It helps to find out the best fit from thousands. The review section of each listed item is the best place to find their service quality. Anyone can leave a review of the shop based on their experience with them. It will help other users to filter out the bad ones among them. The website also includes many other information and features regarding the dealer like a comment section, social network links, photos and videos, a send email option, opening times, payment methods they accept, etc. So that no doubt will remain in your mind regarding the specific dealer you searched. For more user-friendliness, InfoisInfo has a filter system where you could set particular filters to get the exact results. For example, if you are looking for a shop resides in your State, you could choose that state from filters and continue the search. Now, the website will only display the dealers who function within the selected State. There is also category based filters in case you need some other product queries. All in all, if you are looking for some mobile related services or decided to buy a new smartphone. And you are not trusting the online dealers on e-commerce websites, InfoisInfo can help you in the process. With a relatively large database of mobile dealers, it serves thousands of users each day for their needs. You could also give a try from the following link – Here you can check mobile phone shops in your area!